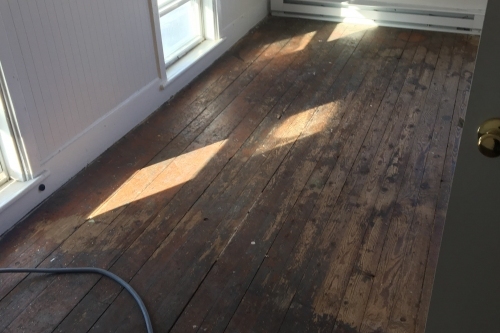 Before: Old pine floor that was previously coated with deck stain. 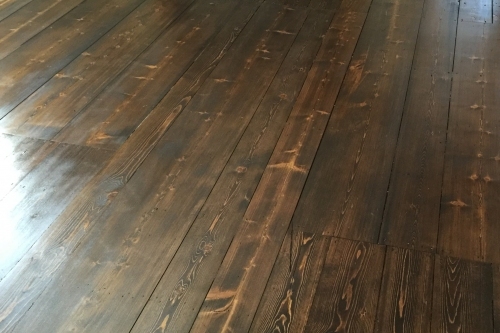 After: Sanded, stained with dark walnut and finished with water based polyurethane. 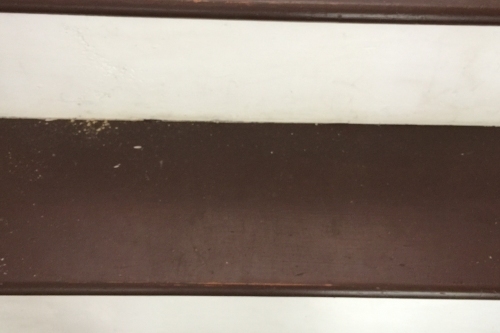 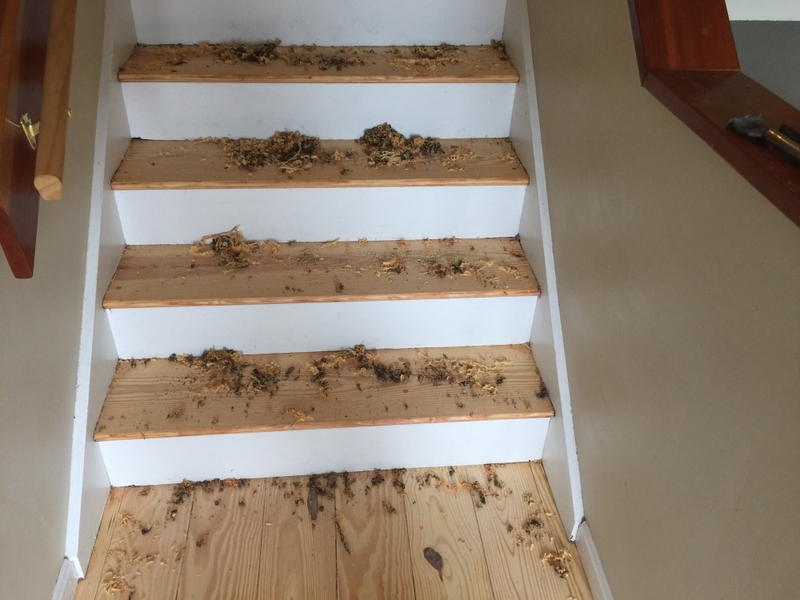 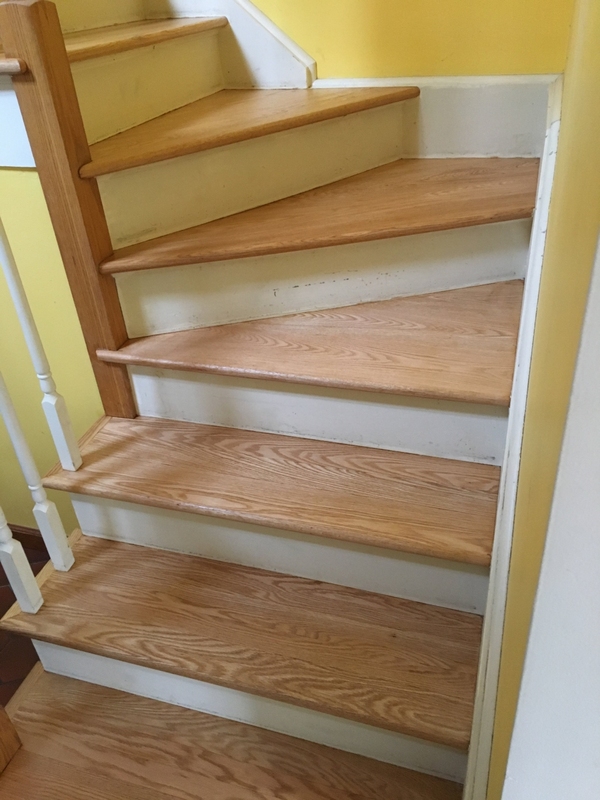 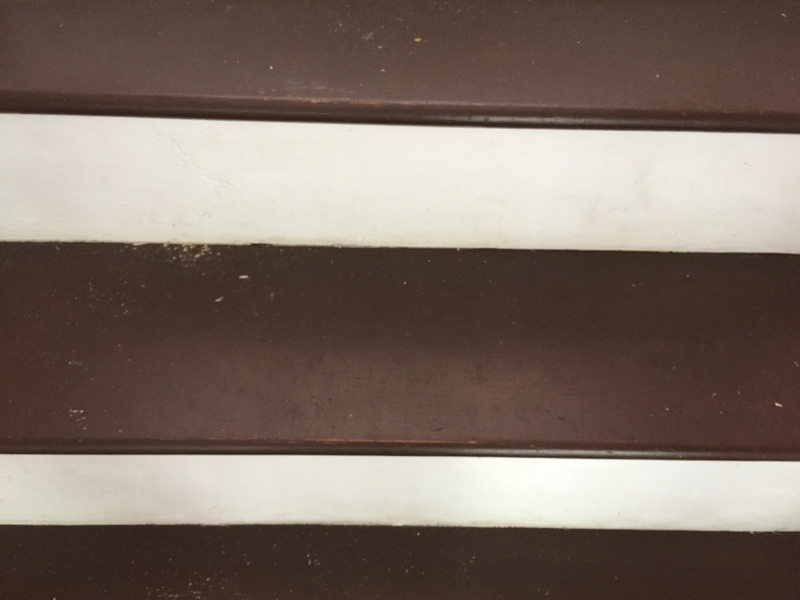 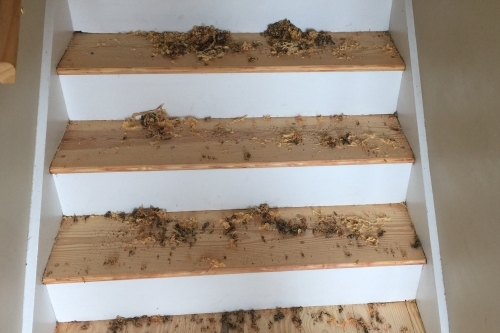 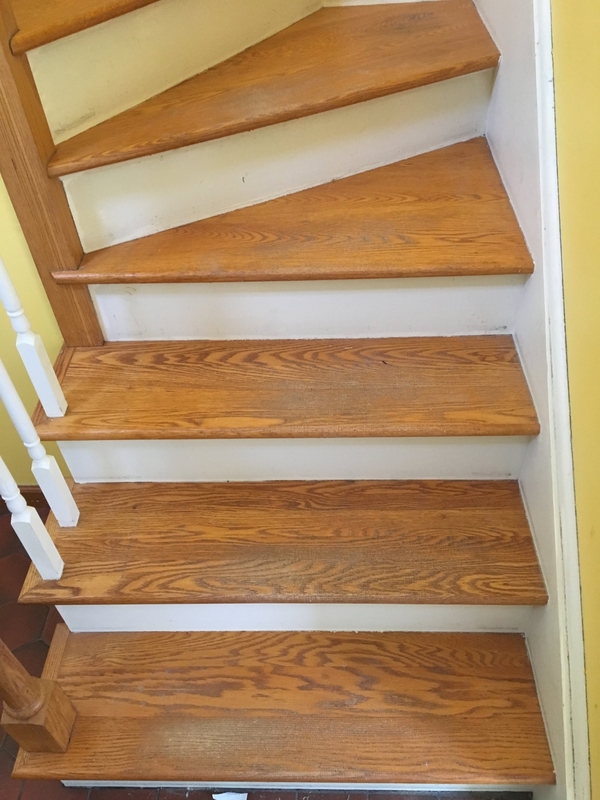 Before: Stairs that have been excessively coated with floor stain. 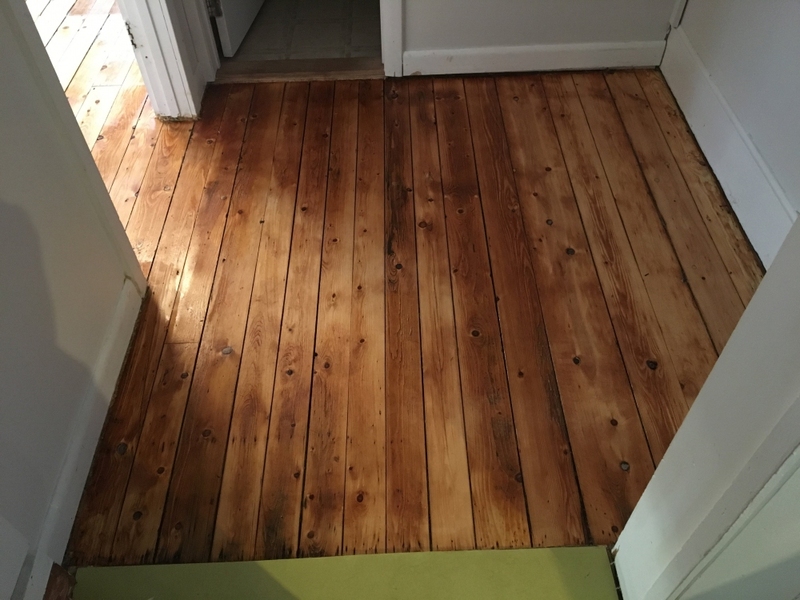 Progress: Sanded and scraped to reveal hemlock. 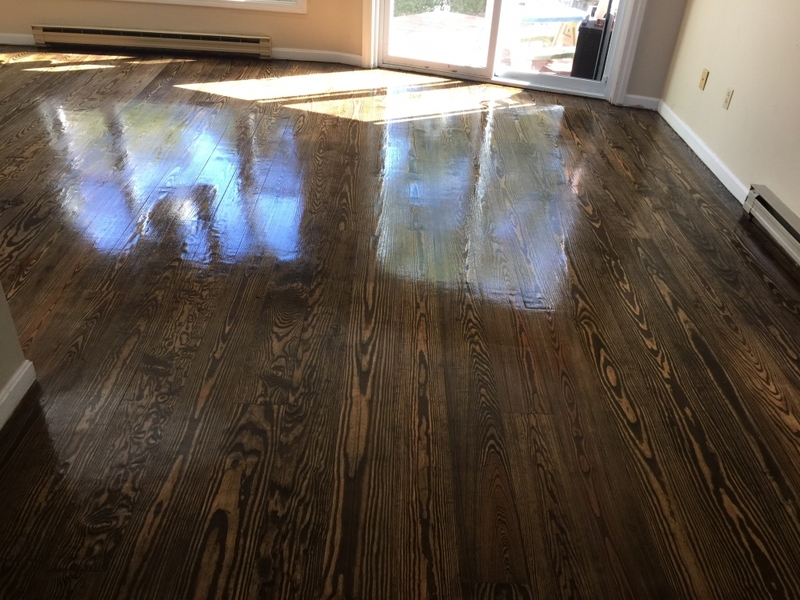 After: After fining up they were stained a mixture of dark walnut, ebony, natural and finished with water based polyurethane. 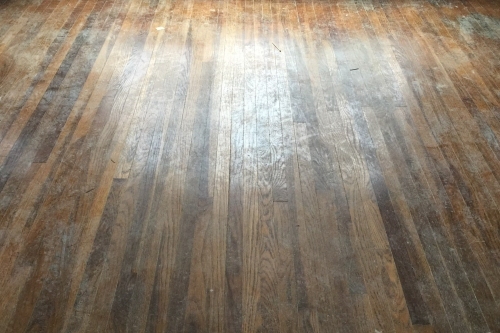 Before: A hemlock Floor that is over Coated with stain. 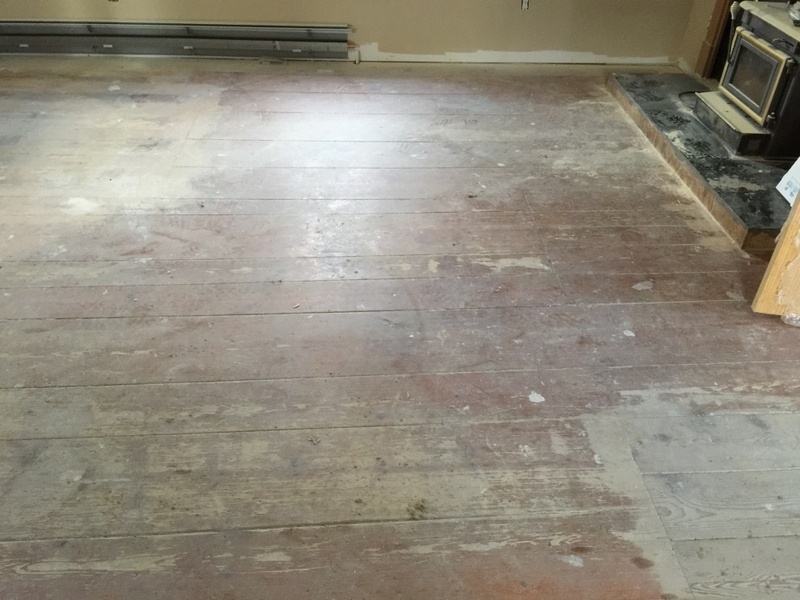 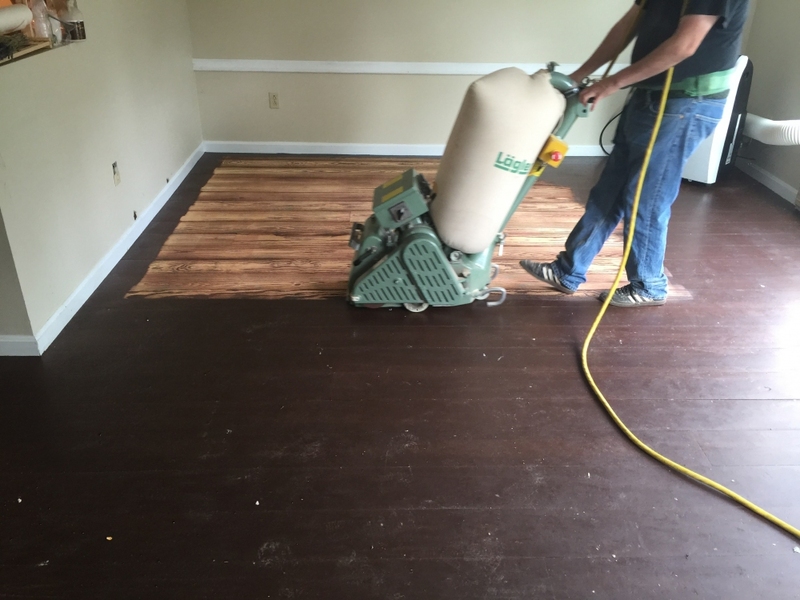 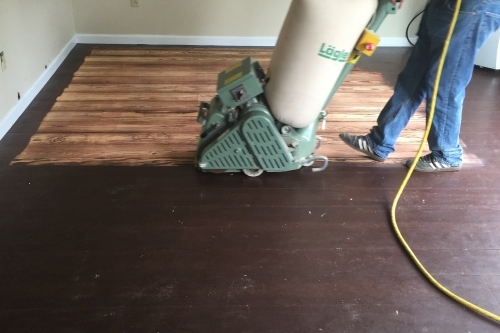 Before: Floors coated in this manner can take several cuts with the big machine to return to them to natural state. 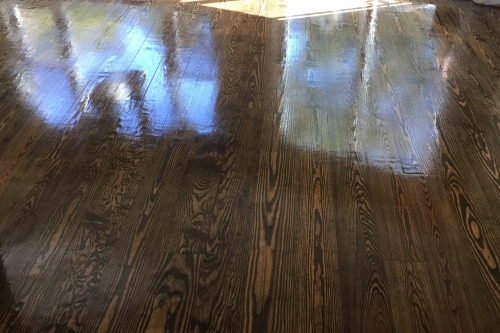 After: Fine sanded, stained and coated with the water based polyurethane. 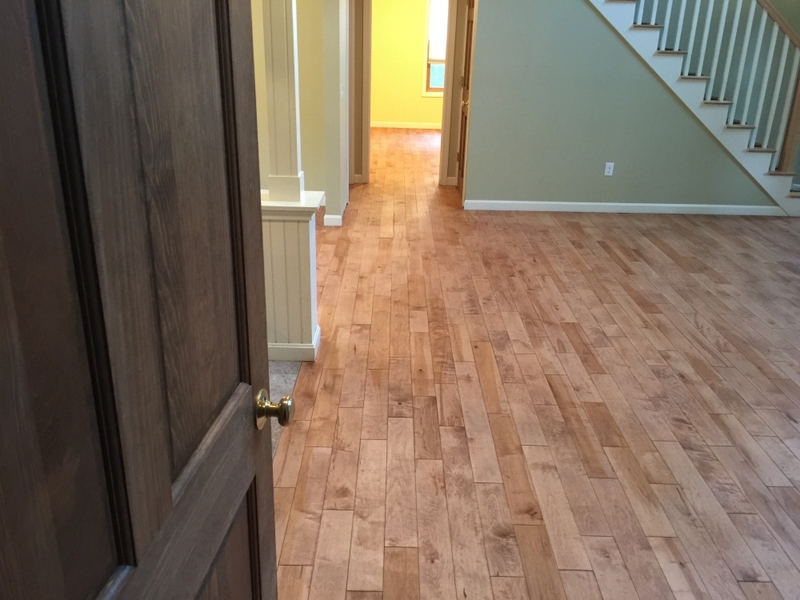 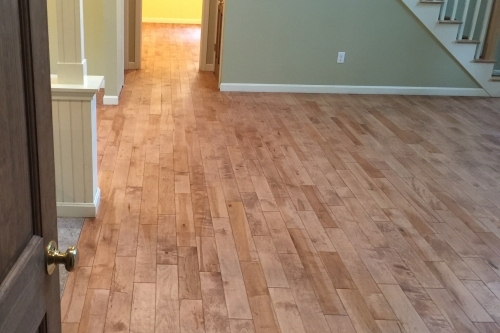 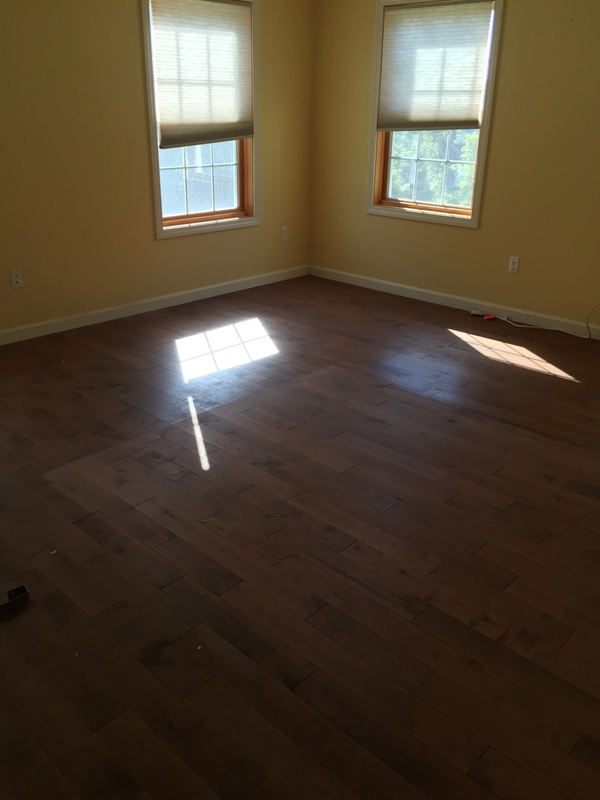 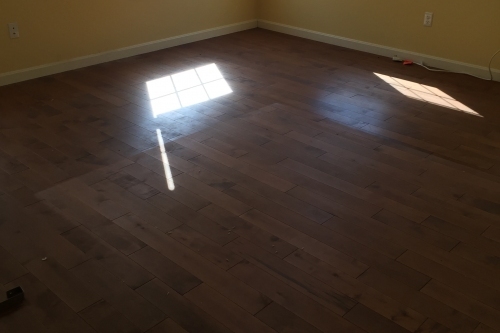 Before: Pre-finished maple floor that has a factory "cherry" color added to it. 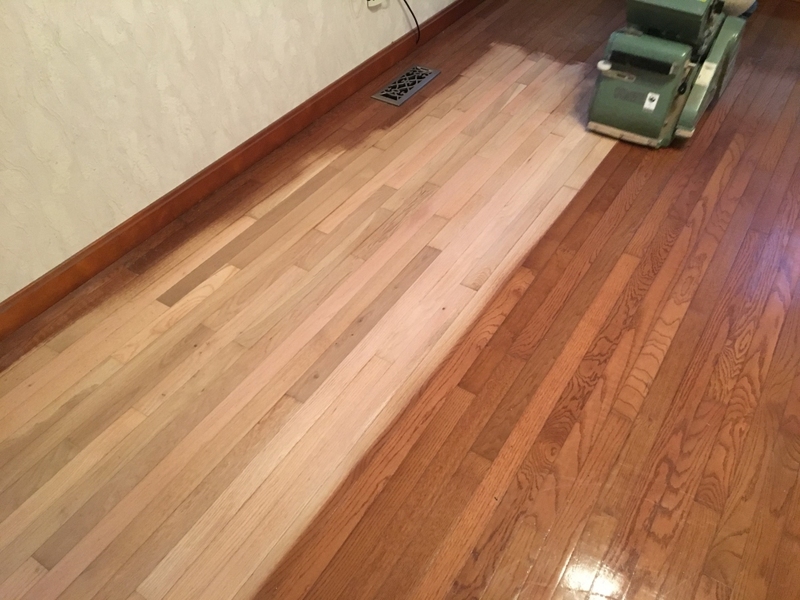 After: Sanding and stained with cherry floor stain. 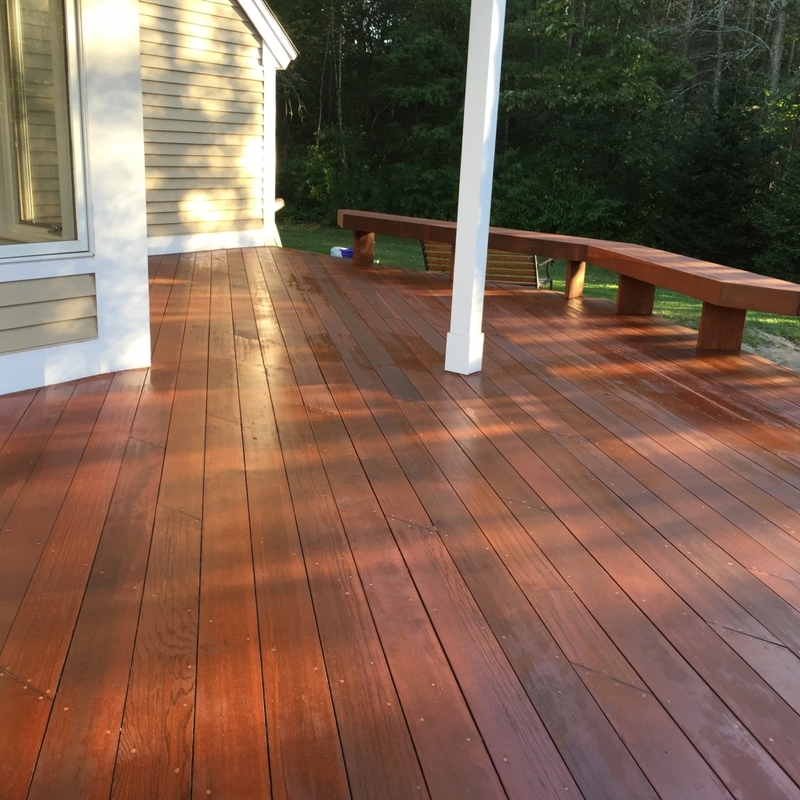 As can be seen manufactures colors do vary from the products available to the public. 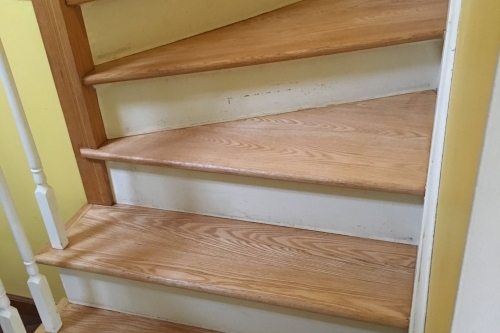 Before: 20 year old pre finished red and white oak. 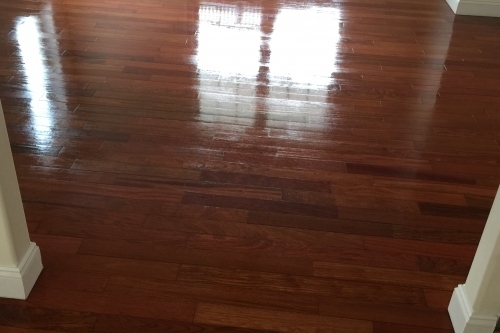 After: Sanding the floor was left natural and coated with the water based polyurethane. 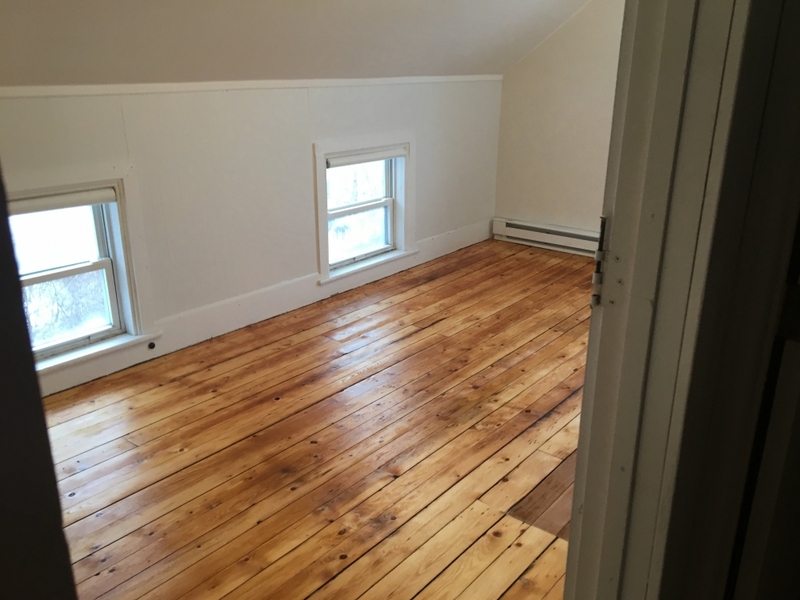 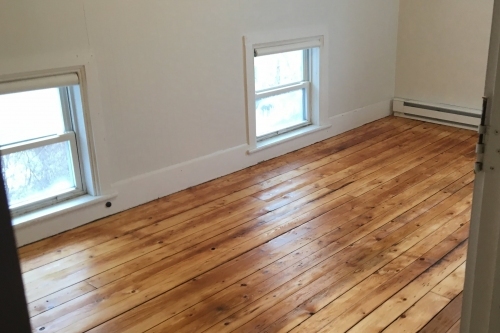 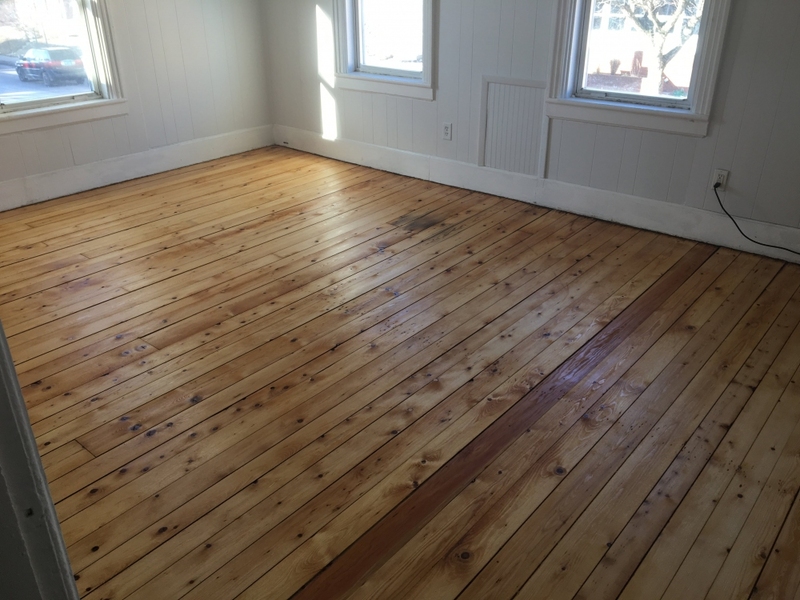 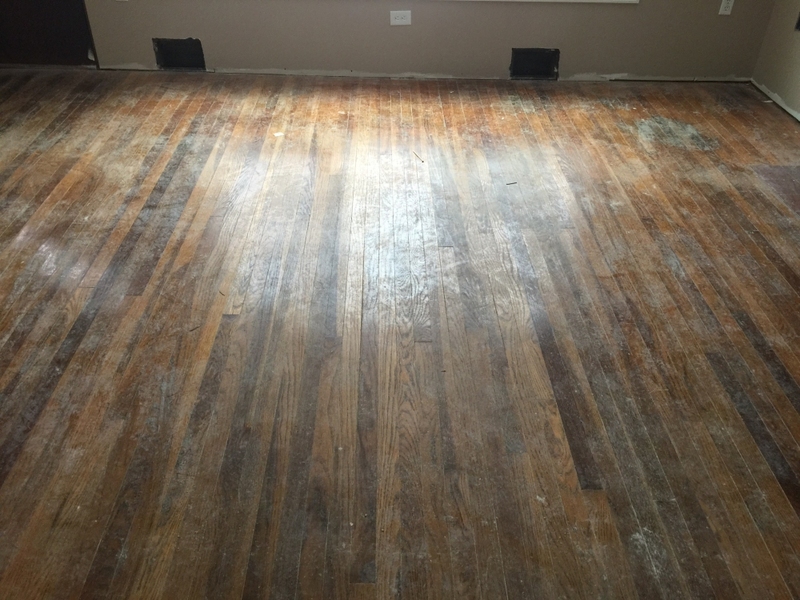 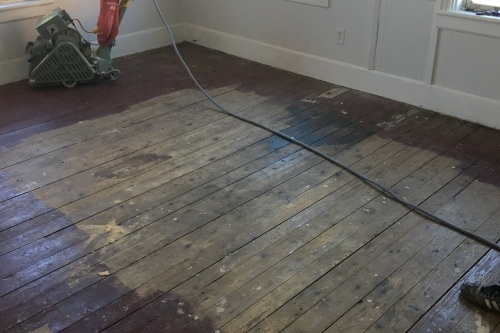 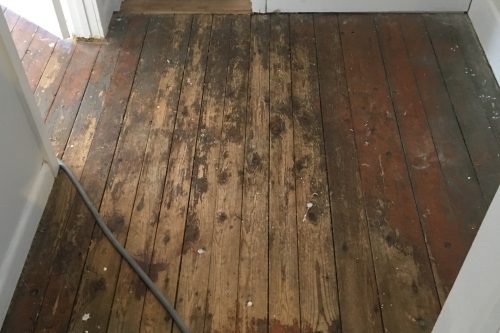 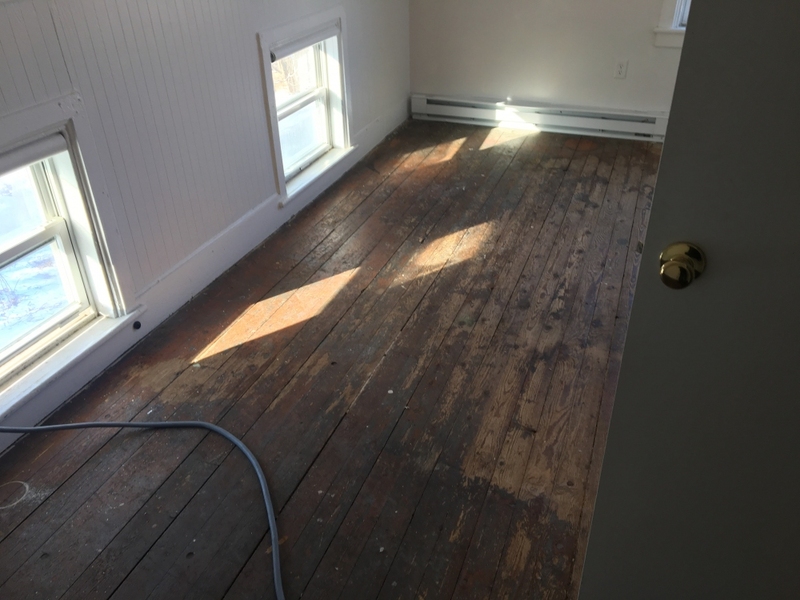 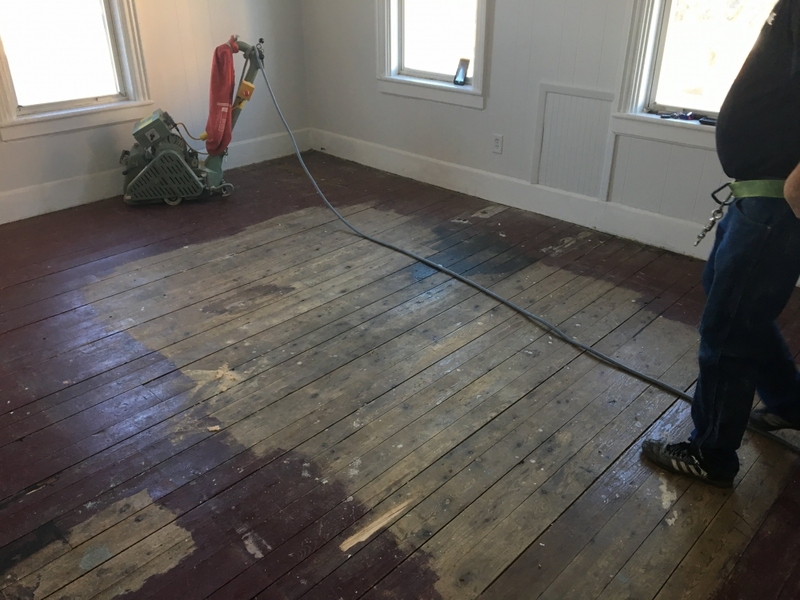 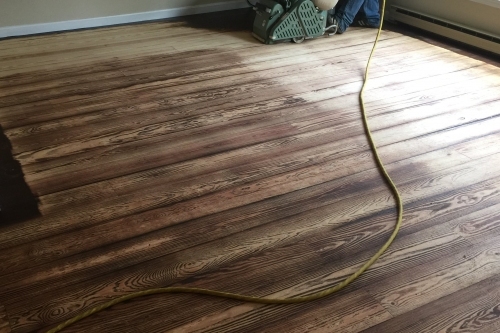 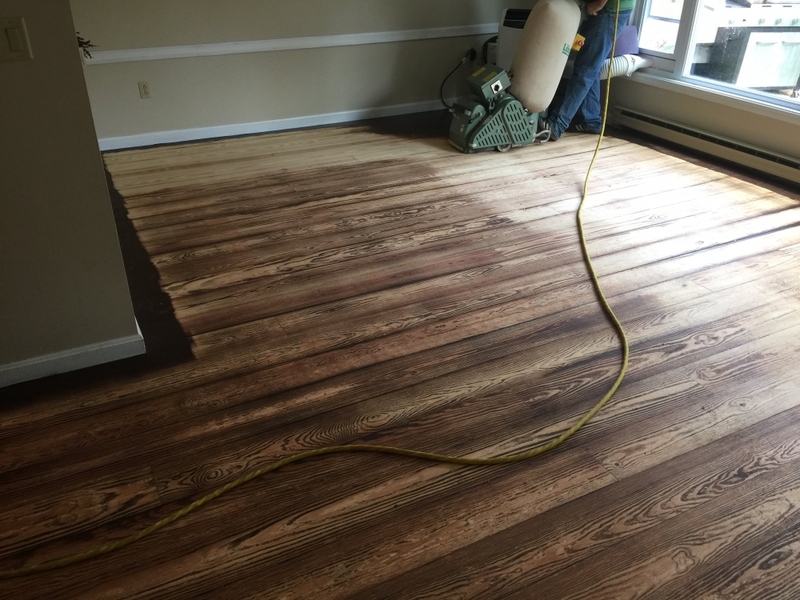 Before: Knotty pine floor that has been coated with floor paint, surface discoloration from years of being unprotected and an oil stain. 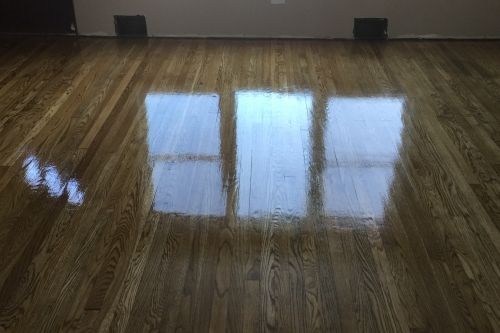 After: Same floor sanded, left natural and coated with the water based polyurethane. 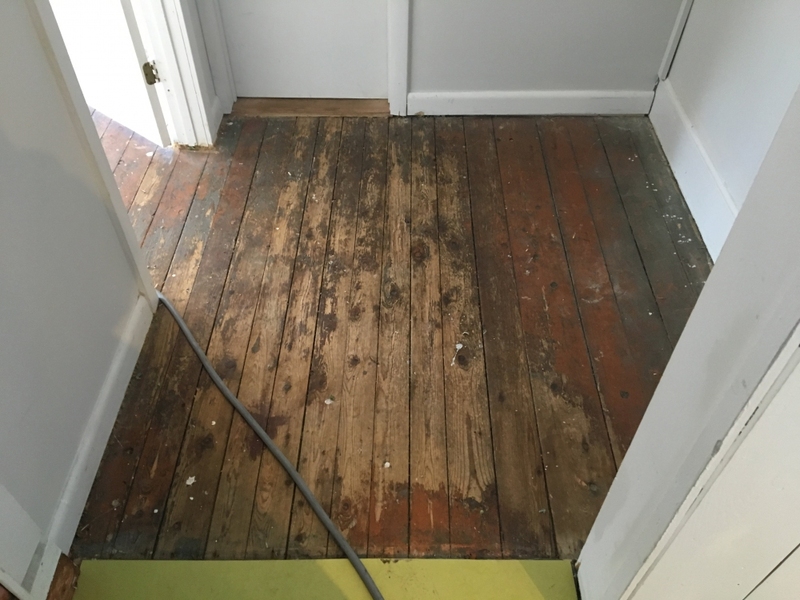 The oil stain had gotten better but will never truly come out. 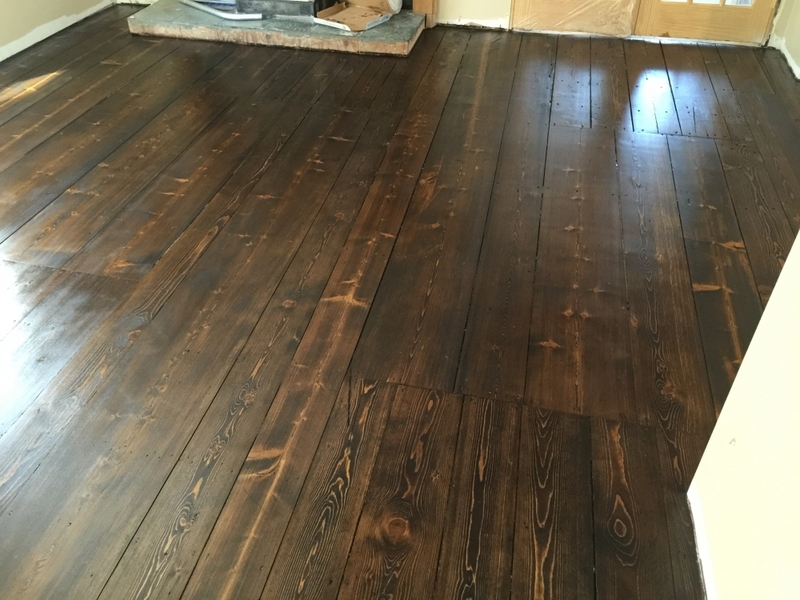 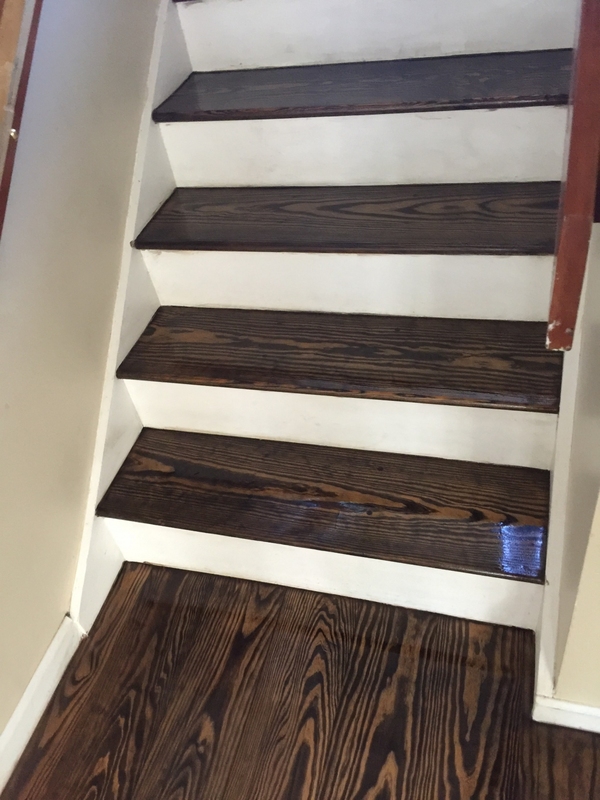 In cases like these a coat of dark colored stain can make them less eye catching. 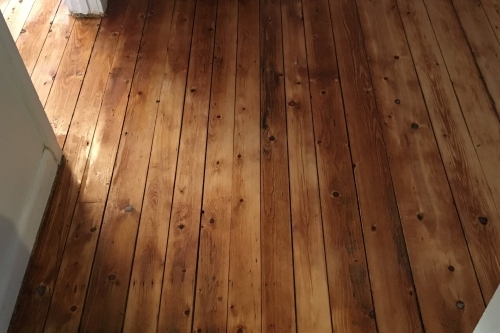 Before: Eastern yellow fir (extinct species of wood) with wear damage and old stain and some residual sticky back tile glue. 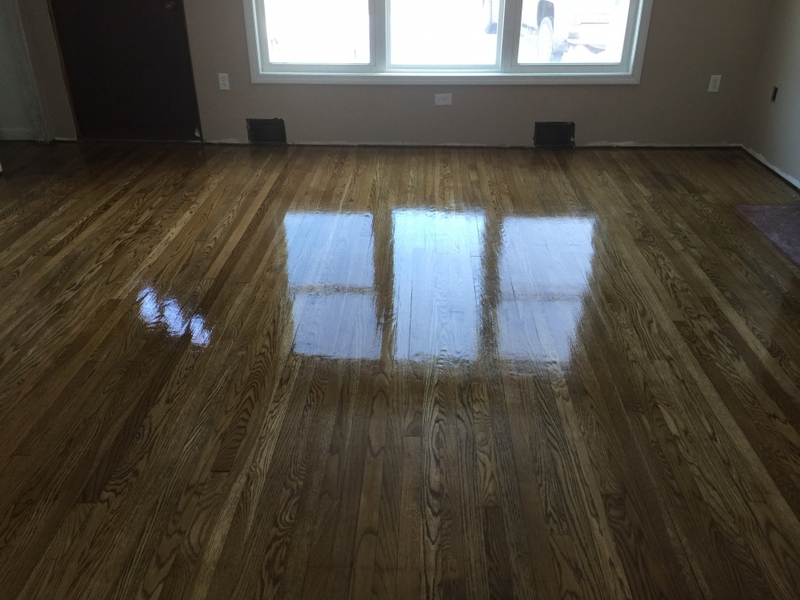 After: Sanded, left natural and coated with the water based polyurethane finish. 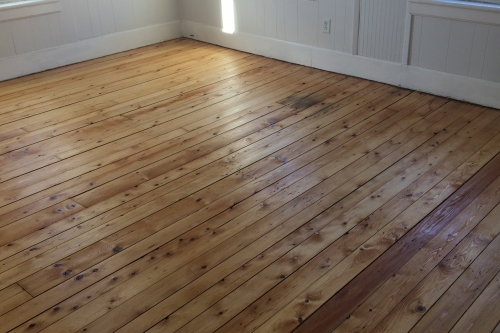 Before: Eastern yellow fir, painted and soiled. 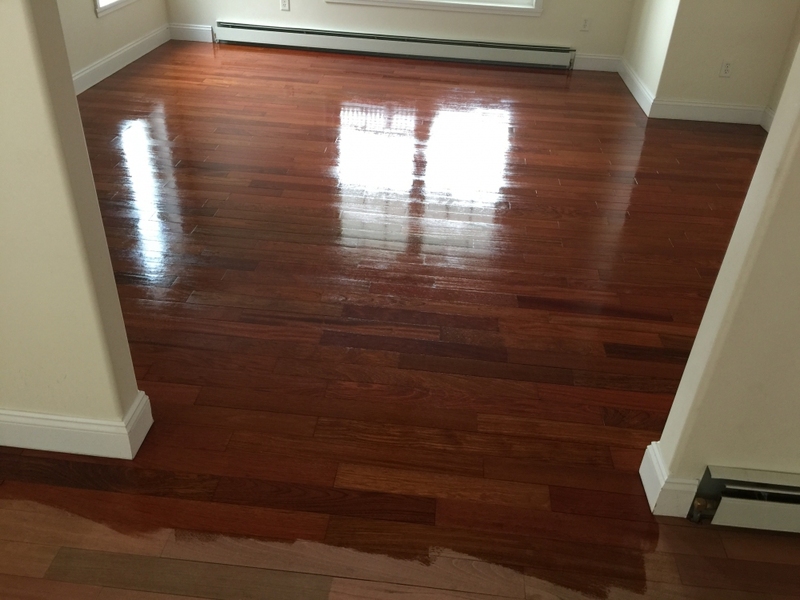 After: Sanded and coated with the water based polyurethane. 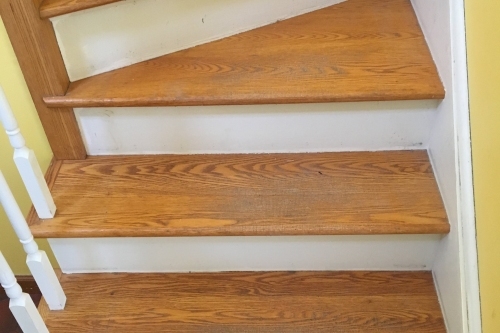 Before: A set of red oak stairs that have had a runner placed over them. 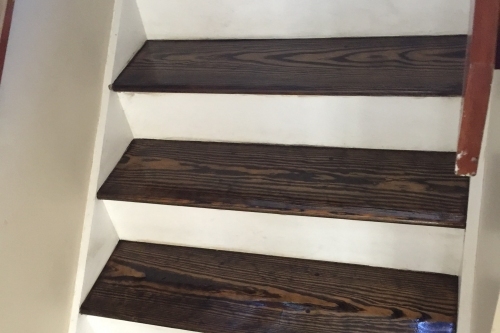 After: The same set of stairs sanded and finished with the water based polyurethane. 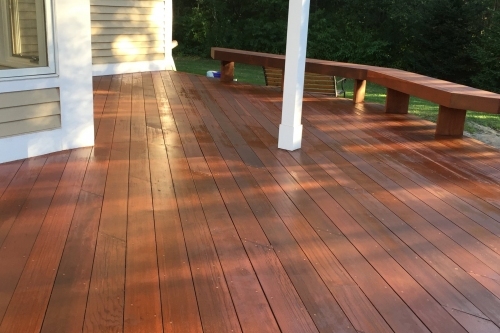 A cedar deck sanded and stained with a deck finish. 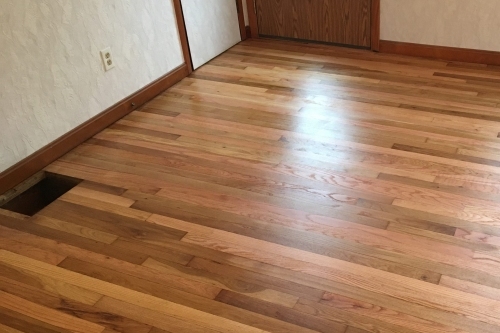 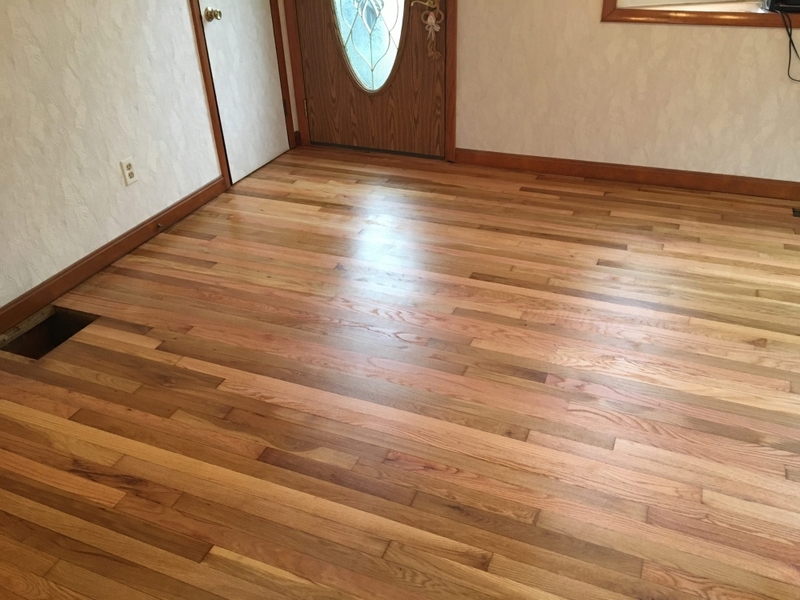 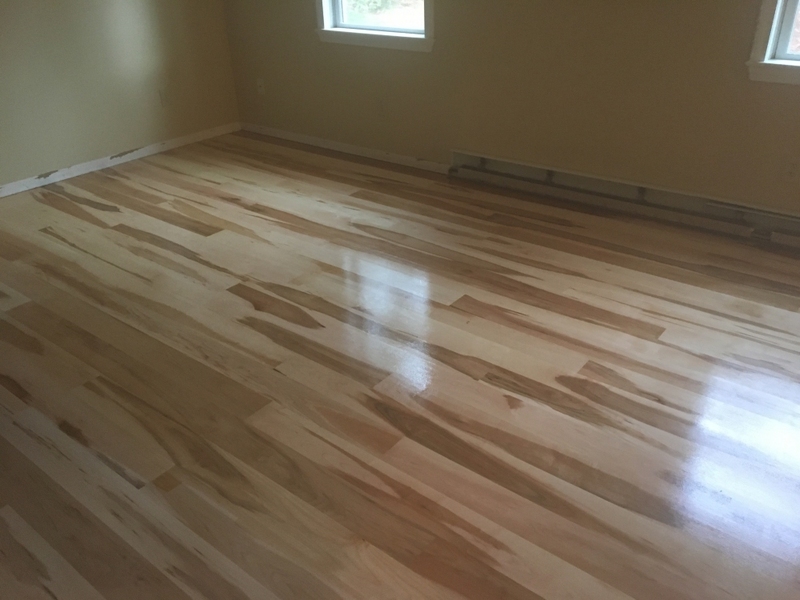 Brazilian cherry that has been sanded and coated with the oil based polyurethane. 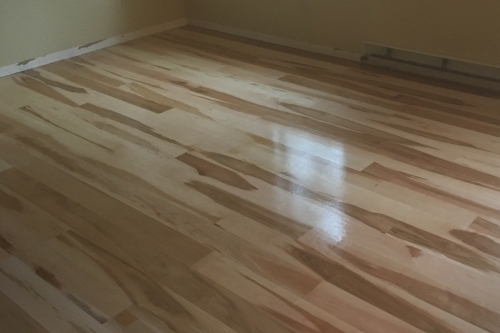 Brown maple floor that was custom milled, installed, sanded and finished by us with the water based polyurethane. 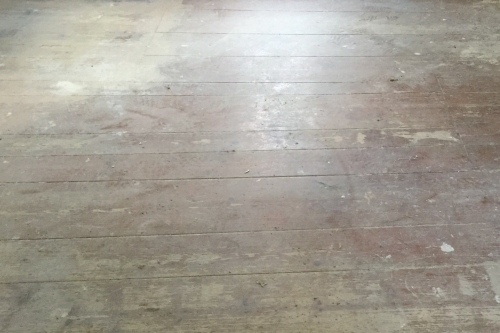 Before: A heavily soiled red and white oak floor. 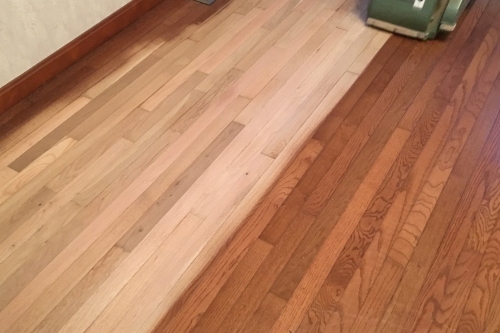 After: Sanded and stained with a mix of darker colors to help distract from the darker stains.